Surprise your special someone with a romantic getaway! Fortunately, Seattle is ideally located with romantic locations aplenty within a one- to three-hour drive, including several resort properties with amenities and activities right on-site or nearby. And remember to book well ahead to get the room or suite of your choice as the right room with the right view can maximize romantic potential. Read on for a few romantic getaways near Seattle. Located in picturesque LaConner, Washington, a stay at the Wild Iris offers the finest guest suites with a king bed, large jetted spa tubs, a fireplace, cozy bathrobes and more. It is located just a short four block walk from downtown LaConner where you can boutique shop to your heart's desire. Take your date to the charming Bunnies by the Bay store, which has plush gifts and adorable baby gifts, and their flagship location right next door offers their trademark bunny designs. Look for the picket carrot fence. Then head to the LaConner Brewing Company for dinner and request the table by the fireplace for a romantic meal. This romantic mountain getaway is a retreat for the soul. 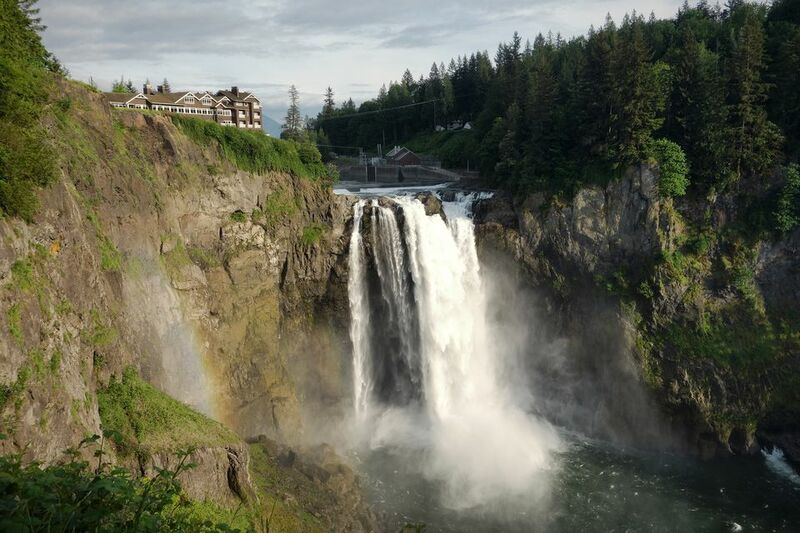 Only 30 miles from Seattle, this luxury hotel is perched right at the top of the stunningly beautiful Snoqualmie Falls next door. There are trails around the area, ideal for taking a romantic stroll, including one where you can sit and stare at the falls, which tumble 268 feet over a cliff! Salish Lodge & Spa has both a spa and on-site restaurant so you won't need to go far to up the ante on the romance factor. There are also romance packages available. If you do venture out to the nearby town of Snoqualmie, you'll find a small, cute town with little shops to explore. Snoqualmie Brewery and Taproom is not far and makes a great stop for beer-loving couples. There's a reason why there's more than one lodge on this list. Lodges might sound quaint in name, but Washington's lodges are grand and located in some of the most pristinely beautiful places the state has to offer. Willows Lodge has double appeal, both for its lodge atmosphere and its location in Woodinville's wine country. It's tough to beat a wine tasting weekend for romance. Make your way by car, bike or on foot to some of Woodinville's wineries (Chateau Ste. Michelle is within walking distance). But also make sure to take full advantage of what Willows Lodge has to offer as well, including two sublime restaurants: Barking Frog or The Herb Farm. Yes, it's spendy, but it's worth it. Or schedule a couples massage at the spa. Really, you can't go wrong. For a high-rolling experience stay at the Tulalip Resort for a night of casino fun. The resort has several dining options right at the hotel, including the upscale Tulalip Bay restaurant. Then take their complimentary shuttle for a short ride to the Seattle Premium Outlets for a day of shopping. The upscale outlet shopping offers designer brands, including couture (Burberry, Coach, Juicy Couture, Michael Kors, Kate Spade) with more than 100 outdoor stores. You'll feel like you're in a smaller version of Las Vegas. Located near Stevenson, Washington, Skamania Lodge is an inherently romantic destination. The lodge is perched on an overlook above the Columbia River. Book a river view room with a fireplace and you won't regret it, as the views here are transcendent - aimed right at the Columbia and highlighted by endless evergreens. There are outdoor recreation opportunities all around the area, but the lodge has a zipline course, restaurants, hiking trails, a hot tub and pool, a spa, golf and an outdoor fire pit where you can roast marshmallows for s'mores. In the winter, the lodge is a winter wonderland. In the summer, it's a recreational wonderland...and also don't miss the outdoor hot tub! Like Skamania, Suncadia echoes the grand hunting lodges of days gone by, but now with modern and upscale amenities that ensure a romantic weekend away. Suncadia is not only a resort, but also a vacation community so there are many things to do right on the property. Go hiking, golfing or book a spa treatment or massage. There are a few restaurants at the resort to choose from, including a cafe, a lounge and a fine dining experience, but the real highlight is that there's a winery! Just a short walk from the main building, Swiftwater Cellars Winery adds an extra touch of romance that most resorts just can't offer. Top 10 Romantic Getaways Near Washington, D.C.